The pairing on this album is unquestionably apt, bringing together as it does works by perhaps the two most famous “aitas” – priests – in Basque music: Father José Antonio de Donostia and Father Francisco de Madina. Whatever the similarities and differences between the two men, the former born twenty-one years earlier than the latter, both composers succeeded in incorporating, with exquisite elegance, a profound sense of local folk traditions into their music, creating works that have since earned classic status in Basque culture. The soprano Arantza Ezenarro was born in San Sebastián in the Basque Area of Spain. 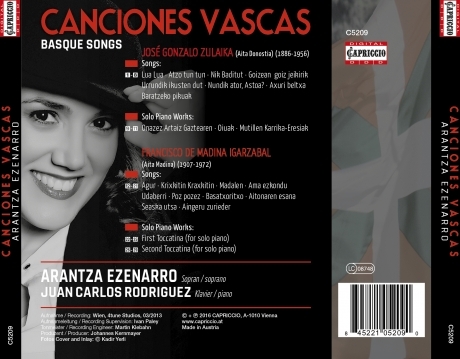 With this Album she presents most sensitiv songs of her homeland.